Looking for a little color in your needle collection? If so, Zings single pointed needles are for you! Zing needles hold perfect, slightly tapered points that make them ideal for all yarn types. They're made of durable light-weight metal that makes them feel light and effortless when held in your hands. They have shiny silver tips with vividly-colored metallic centers. Each size has a color specific to it, with the sizes also laser-printed on every needle. They come in two lengths, 10" or 14". 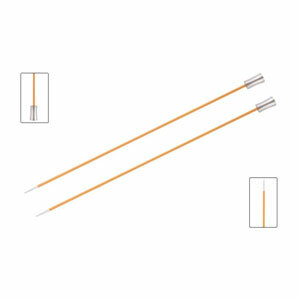 Knitter's Pride Bamboo Single Pointed Needles and Knitter's Pride Karbonz Single Point Needles are both similar needles: 9.75" / 10" (25cm), straight, and US 1 (2.25mm) US size. You may enjoy taking a look at the , and Rowan Baby Cashsoft Merino Cabled Blanket kits all using Knitter's Pride Zing Single Pointed Needles. Knitter's Pride Naturalz Single Pointed Needles From $6.01 to $8.59Select options on sale now!